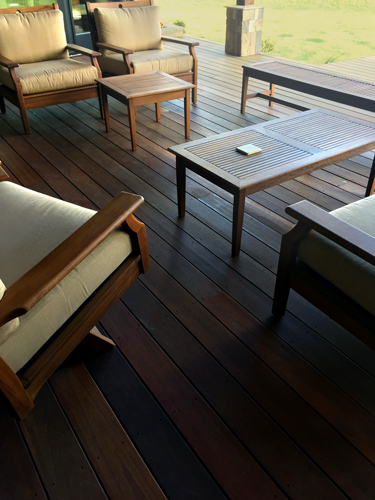 There are numerous options when it comes to maintaining your exterior hardwood deck. One of the key questions that must be answered is whether or not you want to try and maintain the original color of a freshly installed and oiled hardwood deck. Maintaining the color to the fullest extent possible, especially in extreme weather climates, takes regular maintenance. According to professional deck maintenance contractors, their most demanding clients require a light pressure washing followed by a re-application of oil finish every six months. This is especially true in commercial projects such as the typical five-star hotel in Miami Beach. If it has to be as close to perfect as possible, plan on maintenance every six months. The more typical consumer application in a less extreme climate will require maintenance once every one to two years. Generally, it is advisable to re-apply the finish after six months and then repeat again annually for optimal residential decking results. 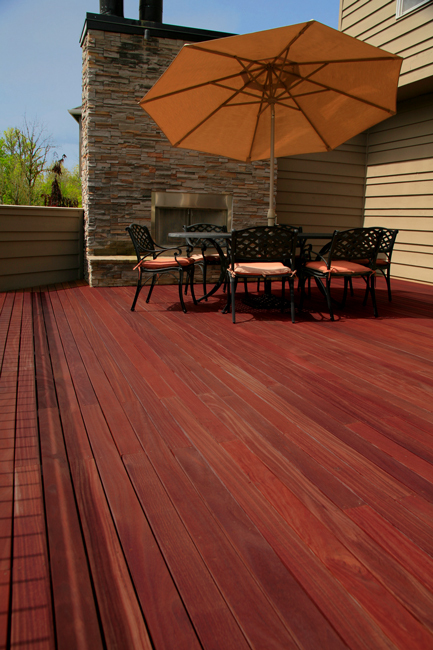 This scenario applies to consumers who want to maintain something close to the original color of the finished deck. Should I finish the underside of my deck? 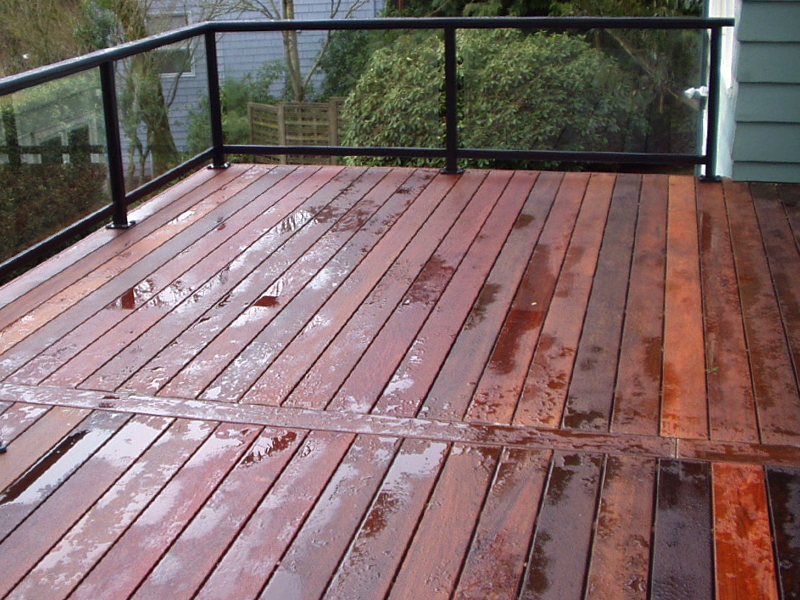 The underside of the deck does not require as frequent an application of oil finish. Initially, if the deck is close to the ground or otherwise inaccessible, you should prefinish the back side prior to installation. If you have access to the underside after installing the deck boards, it’s perfectly ok to spray the oil finish with a standard pressurized garden sprayer from the bottom side. No need to worry about applying too much since gravity won’t let us walk on the underside. What if I just want my deck to gray out over time? Back to maintenance… if you want your deck to gray out and stay that way, then the best approach is to use a water-based nano technology treatment such as Seal-Once; use the version that has no pigment and then keep applying every 5 years. It’s like a Gore-Tex rain jack for your hardwood deck boards. You can also apply Seal-Once after other coatings – or you can apply it before an oil based coating for an extra measure of protection. We are here to answer questions about installation and maintenance – just post a question on the ExoDek.net blog in response to any of our articles and we’ll respond. But don’t bother spamming us, we won’t answer. It should be noted that light pressure washing followed by re-application of oil finish will gradually darken the hardwood decking. If you desire to bring the finish as close as possible back to original color, then a deep pressure washing is required. For ExoDek Premium Batu Hardwood Decking, a maximum pressure of 2500 psi should be used at a distance of no less than 4” in order to avoid tearing the wood fibers. Alternatively, sanding with a conventional hardwood flooring sander will also bring the material back to its original unfinished color. Sand paper grits as low as 80 grit can be used on hardwood decking. It’s important to select a sander with flexible backer so that the sandpaper can follow the contour of individual boards. Higher grits such as 150-200 will wear out extremely quickly and get gummed up with oil and dirt. We recommend starting with 80 grit and only dropping lower if the deck hasn’t seen any maintenance for several years. It is also possible to use a random orbital sander, running the handheld sander down the length of each board. This is certainly a tedious process so we strongly recommend you have knee pads and Advil at the ready. Last we checked, you could rent a floor sander from Home Depot for about the same price as a decent handheld random orbital. When applying the actual oil finish, it’s critical not to let the oil puddle up. We find it most effective to roll it on, not too heavy, and then back roll it within 2-3 minutes. Too much oil on top of the boards will not offer additional protection since it will not soak into the wood; and, too much oil will show footprints for weeks after finishing. Why are my deck boards buckling? In very close to ground situations, extreme caution must be used. Deck boards can move over 1/4” in width, even 5/16” on 6” boards. We’ve seen many claims because of lack of ventilation, inadequate spacing – the result is exactly as one should expect: the boards are installed in dry conditions with less than 1/4” of space edge to edge and just a few inches of ventilation; then it starts raining for two or three months – the boards expand, then they buckle, then the whole deck blows up and the customer files a claim for “defective wood”. It’s always defective installation. Wood is a predictable material in terms of its movement due to changes in moisture.